Remember...that website or catalog may sometimes have good prices but it can't diagnose problems or repair your bike like the trained mechanics at these participating shops. Compare our discount to the on-line purchase price plus shipping costs and you will most likely find that supporting the shops that support our sport is always a better deal. 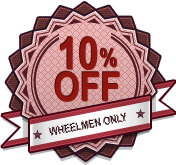 The following shops offer a 10% discount on parts and accessories to all members with a valid membership card. Spokes - Wheaton 69 Danada Square E.